This vigorous vine has pinnate leaves with 2-4 leaflets, the terminal leaflet forms a tendril. 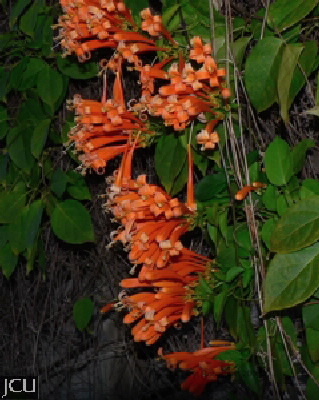 Originally from South America, the large masses of orange to red tubular flowers form a brilliant display in October. Growing on a wall associated with Biological Sciences, this vine was previously known as P. venusta.